Mission Style Tile Top 3-Piece Breakfast Set. Bar Set Of Classical Style In Cappuccino Finish Details: Table: Length: 36 x Width: 36 Stool: Height: 29 Bar Table In Cappuccino Finish (4555 (CO)). Bar Stool With Cushion Seat In Cappuccino Finish (4556 (CO)). Easy To Assemble. Set includes the Table and 2-Chairs. 3-Pc Bistro Dining Set. Strong Construction. Easy To Assemble.Details: Table Size, 30 In.Dia., Chair Size: 15-1/3 In. (W), 17-3/4 In. (D)., 37 In.(H). *In stock. This product normally leaves our warehouse within 1-2 business days. * Quantity Discount Available. Cherry/Green Tile Top 3-Piece Breakfast Set. Table Size, 34x22x34H. Stool Size, 24. Strong Construction. Easy To Assemble. 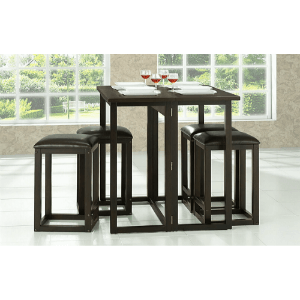 3 Pcs Breakfast Table and Chair Set. Includes Glass Table and Two Bar Chairs. Strong Metal and MDF construction. Easy to assemble. Bar Height.Table Size: 47 In. x 16 In. x 35 In. 3-Pc All Natural Portable Breakfast Set. Solid Wood Top/Drop Leaf Breakfast Set. Dimensions: 27-1/2L. X 29W. X 33H..
3-Pc All Natural Portable Breakfast Set. All Natural Frame, Tile Top/Drop Leaf Breakfast Set. Easy To Assemble. Dimensions: 27-1/2L. X 29W. X 33H. 3 Pcs Breakfast Table Set. Includes Two Chairs and One Table. Easy to assemble. Solid Metal and MDF Construction.Table Size: 48 In. x 16 In. x 35 In. 3-Pc Breakfast Set In Natural Finish. Natural Drop Leaf Table (With 8 Leaf), And Two Bar Stools. Table Size: 46L., 30H.. Stool Size: 24H.. Strong Construction. Easy To Assemble. 3-Pc Set Farm Table And Chairs. Natural Solid Wood Drop Leaf Farm Table. Strong Construction. Easy To Assemble.Table Size: 26-1/2-44L., 39W.. Spindle Back Chair In Natural Finish. (Seat/Back Assembled). Chair Size: 18L., 18W., 36H.